Dwight Braxton was born January 5, 1953 in Baltimore and grew up in Camden. Dwight turned to crime as a teenager and was convicted of armed robbery at the age of 19. His sentence landed him Rahway State Prison, which offered boxing as part of its rehabilitation program. Dwight learned his craft from James Scott, a light heavyweight contender from Newark who was six years his senior. Dwight was also introduced to Islam in prison. 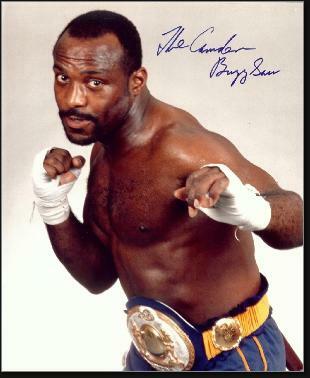 After his release at age 25, he changed his name to Dwight Muhammad Qawi. Dwight decided to become a professional boxer and trained in Joe Frazier’s Philadelphia gym. He adopted Smokin’ Joe’s aggressive style and within three years was considered a light heavyweight contender. He earned the nickname The Camden Buzzsaw for his lethal hooks and upper cuts. There was little subtlety in his approach. In the fall of 1981, Dwight fought Scott in Rahway State Prison and won a 10-round decision. The victory led to a title shot against Matthew Saad Muhammad in Atlantic City. Dwight won in an upset, scoring a TKO in the 10th round. 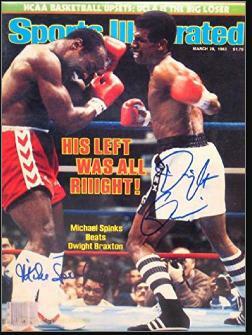 Dwight held onto to the title until 1983, when he dropped a decision to Michael Spinks. He moved up to the Cruiserweight division and won the world title in 1985 with a knockout of Piet Crus in South Africa. Dwight defended his new title twice—including a victory over Leon Spinks—before dropping a 15-round split decision to Evander Holyfield. A rematch with Holyfield in 1987 didn’t go well, resulting in a 4th-round knockout. Dwight continued to fight and win for nearly a decade, but was unable to win back his title. He battled a drinking problem for much of that time. Dwight retired at 46 with a career record of 41–11–1. After leaving the ring he found work as a trainer and also counseled at-risk teenagers in Mays Landing.